Be informed so you can make a confident Medicare choice. To request a downloadable copy of “Making Sense of Medicare: The Medicare Basics Guide” and receive information about Medicare Advantage and Prescription Drug Plans, fill out the form to the right. SilverSneakers is a free fitness program that helps millions of seniors set fitness goals and keep in shape all year round. 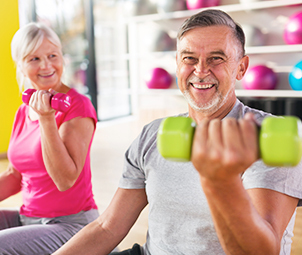 To be eligible for the SilverSneakers program, you must be 65 years of age, and must be enrolled in a Medicare Advantage or Medicare Supplement plan. With more than 14,000 locations around the country, there are plenty of fitness centers from which to choose. Most centers include weights, treadmills, pools, and fitness classes with certified instructors. Original Medicare does not cover fitness programs or gym memberships. However, if you have Medicare Advantage or Medicare Supplement plan, you will most likely be eligible for the SilverSneakers program. To find out if you are eligible for SilverSneakers, simply go online to SilverSneakers.com and submit your information. After you find a location, take your 16-digit SilverSneakers number to any of the participating locations for instant access to equipment and fitness classes. What Happens if I Do Not Live Near Any Participating Fitness Centers? Exercise classes for all different types of fitness levels (SilverSneakers Classic, SilverSneakers Circuit, SilverSneakers Cardiofit, FLEX Classes – click here for more classes). With no obligation to enroll in a plan.